WhatsApp is no doubt one of the most popular instant messaging apps. It has around 1 billion active users. This application is a multi-platform one ad this is the best part of it. Whatsapp is really enjoyable on the smaller screen but what if you wish to use it in the bigger screen like on your laptop or PC? Another great way to get Whatsapp on the PC is through the BlueStacks emulator. Two types of BlueStacks emulator are available, normal and Thin. Many of the users have stated facing issue while using the Normal BlueStacks emulator, so we suggest you use the Thin BlueStacks emulator. Read the process here in step by step. 1. Download Bluestacks App Player on your computer. 3. Run the setup file to install it. During installation, Bluestacks will ask for App Store Access and App Notifications. You can uncheck both while installing.But ensure first to have at least 2GB free space before downloading. 4. Wait for the installation to finish (it takes several minutes). During the final stages of installation, Bluestacks will run in full-screen mode. Tap the diagonal line icon on the top-right to run it in windowed mode. This makes the next few steps easy. 5. Leave Bluestacks App Player running and go to your browser. 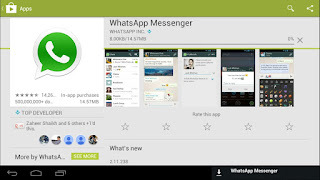 Download the WhatsApp apk file. 6. Double-click the WhatsApp.apk file that’s saved on your PC. The app will automatically install itself in Bluestacks App Player. 7. In Bluestacks, you’ll see a grid of apps you’ve installed. Find and launch WhatsApp. 8. Enter your phone number and click Verify. 9. Now wait for 5 minutes as WhatsApp tries, and fails, to automatically verify using SMS. 10. After 5 minutes, WhatsApp will offer you an option for voice verification. Click Call me. 11. You’ll get a phone call. Answer it and you’ll hear the verification code being spoken in loop. 12. Enter the verification in WhatsApp (running in Bluestacks) and you’re good to go. 13. None of your existing contacts will show up in WhatsApp if you use this method. You can still reply to any messages you receive. 14. You can add contacts individually to WhatsApp by clicking on the three dots icon on the top-right > Contacts. Click the contact icon on the top-right, next to search. These contacts will be saved locally and will not show up on other devices. You can then start sending messages to these contacts as well. 15. Any groups you’re a part of will also not show up on the PC. You will have to ask the group admin to add you to the group again. 5. Wait for WhatsApp to install on your computer. 6. Once the install is complete, you will see a QR code on the screen of your PC. 7. Open WhatsApp on your smartphone and go to WhatsApp Web. If you’re hoping to use WhatsApp on both your PC and your phone at the same time, you are out of luck. One phone number can be associated with only one device at a time – your phone will stop receiving WhatsApp messages when you’re using it on the desktop. Another limitation is that you can’t switch between the two devices instantly. WhatsApp imposes a 20-minute delay between two verification attempts (this delay keeps increasing with each verification attempt on the same day), so keep that in mind when setting it up on any device.